I have written several blog posts this year about giving our young athletes nutritious and timely meals while at home. So now that you have a well-fed athlete you can’t stop there. Good nutrition should continue during competition just as did at home. The ESPN Wide World of Sports Complex has several options to help your athlete stay nourished and hydrated while they are competing. 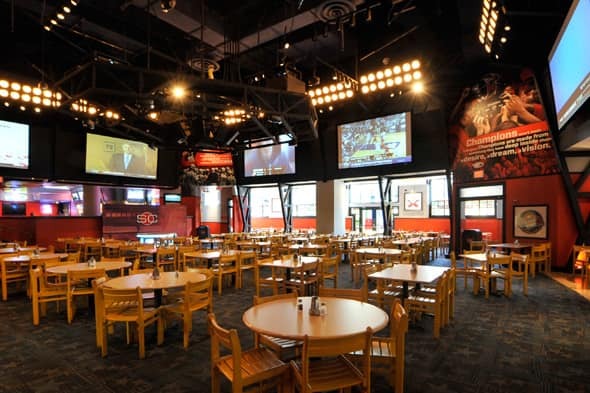 The ESPN Wide World of Sports Grill is a full service restaurant located in the heart of the Complex. Their menu includes healthy favorites such as a ginger-marinated chicken sandwich, fresh vegetable pita and salads. For those who are looking for a quick treat they also offer fan favorites such as chicken breast nuggets, wings and nachos. In addition to the Grill there are concession stands, carts and food trucks throughout the Complex. You are never too far away from a healthy snack or treat. Box lunches - Turkey, Ham, Vegetarian, Italian Sub and PBJ. These meals include potato chips, a fresh baked cookie, an apple and a 12 oz. bottle of water. Snack Box which includes (10 of each) dry snacks, granola bars, bananas, apples, water and PowerAde® on ice. Cooler - you can get a cooler with ice delivered to your field to keep your beverages cold during the competition. Special Functions - if you are looking for something not available above or would like to have a private party at the Complex you can fill out the online form (in the Special Functions section) to convey your request. A couple of things to note about pre-ordering food and drinks for your competition: all orders must be completed two days prior to your event and there is a minimum order of $50.00. I am always looking for ways to make my life as a team mom easier while at a tournament. Planning nutritious meals and snacks prior to arriving helps me relax a little bit more while on site... and we all know how much I like relaxing.